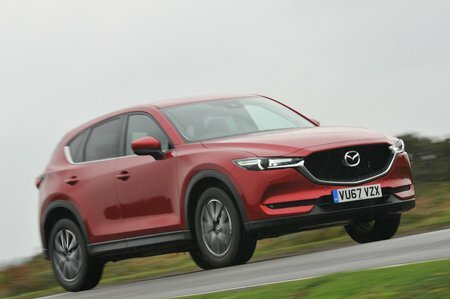 Used Mazda CX-5 Review - 2017-present | What Car? What's the used Mazda CX-5 estate like? The success of the original Mazda CX-5 almost took the Japanese firm by surprise. Launched into a burgeoning family SUV market then dominated by the Nissan Qashqai at one end and the Volvo XC60 at the other, it went on to become Mazda’s best-selling model, with a global output of more than 1.5 million. So, when this latest version came along to replace it in 2017, it kept all the bits that worked – the size, the space and the tidy handling – and upped the overall efficiency, the driving capability by neat fractions and overall refinement, resulting in a product of exceptional competence. The engine options are two 2.2-litre diesel engines, with 148bhp and 173bhp, and a 163bhp 2.0-litre petrol. The petrol is fairly smooth but feels a little underpowered lower down, just where the more relaxing diesels push out plenty of shove. The difference between the two diesels is marginal, although the more powerful unit is available only with four-wheel drive and the less powerful unit has the better official fuel economy figures. There are just two trim levels to choose from on early examples: SE-L Nav and Sport Nav. The former gets you plenty of kit, including cruise control, climate control, front and rear parking sensors and automatic light and wipers, while the latter adds fully electric leather seats (heated in the front), keyless entry, a powered tailgate and a head-up display. In early 2019, the range changed to SE-L Nav+, Sport Nav+ and GT Sport Nav+, and the standard level of safety equipment was improved to include adaptive cruise control, blindspot monitoring, rear cross traffic alert, automatic emergency braking, lane departure warning and lane-keeping assistance. Where the CX-5 really shines out in this class is in its handling. Push it in to a bend and it grips well, its appeal upped by steering that's accurate and sharp, and it handles with a rare dignity for an SUV. The only payback for this eagerness is a rather firm ride that can occasionally be caught out by road imperfections and potholes. It’s not terrible, but there are more comfortable cars in the class. Road and wind noise, however, are well suppressed for a large SUV and help to make the CX-5 a relaxing motorway cruiser. The interior is full of soft-touch materials and has an air of good quality; it’s an improvement on that which it replaced. 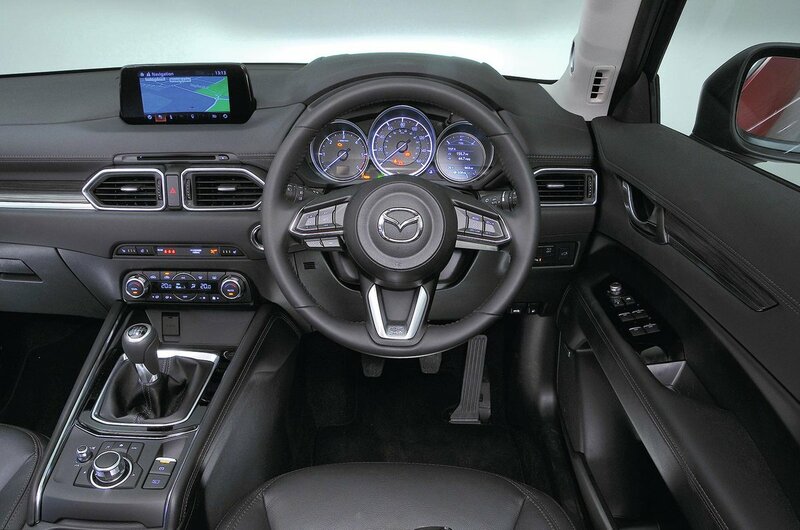 The driving position is excellent, as is visibility, while the infotainment system is slick and relatively easy to use, with logical controls and all on-screen action done via a rotary controller. Those looking for full smartphone capability will need to look for a revised 2019 car, because that's when Apple CarPlay and Android Auto were added to the infotainment system. Needless to say, space in the front and rear is good, too, although one or two rivals have more and some the ability to seat seven. The CX-5's rear seats split in a flexible 40/20/40 arrangement and fold away with the flick of some levers in boot, and they have a two-stage reclining mechanism. The boot itself is large and has no annoying lip to have to lift items over, plus the extended floor is flat.